Last Tuesday night Unley made a decision on Brownhill Creek. A decision in line with the other 4 councils but a decision that protects the creek owners. Whilst we were the last to make a decision and we took two dedicated meetings to do it we have continued with the decision made to provide leadership on the complexity that is Brownhill Creek. Way back when we backed exploring the culvert option to ease the pain of the property owners adjacent Brownhill Creek Conservation Park. We were the council promoting water harvesting back in 2012. We are the council now who is watching out for the interests of the creek owners. In making the decision we have, and I understand that Minister Hunter is grateful for the decision we have made, we have ensured that the SMA will not take the project away from Local Government which means that the interests of our rate payers will not be lost. In making the decision we have the interests of those most affected by the project, the creek owners of Unley and or Mitcham will be looked after. Had we not made the decision we made the SMA would have had the opportunity to take over the project on the basis that Local Government had demonstrated an inability to govern such a project. With respect to the SMA they are a State Government body and the State Government has a reputation of running rough shod over residents with such projects. This is evidenced by the recent grade separation of the Seaford and Belair train lines. 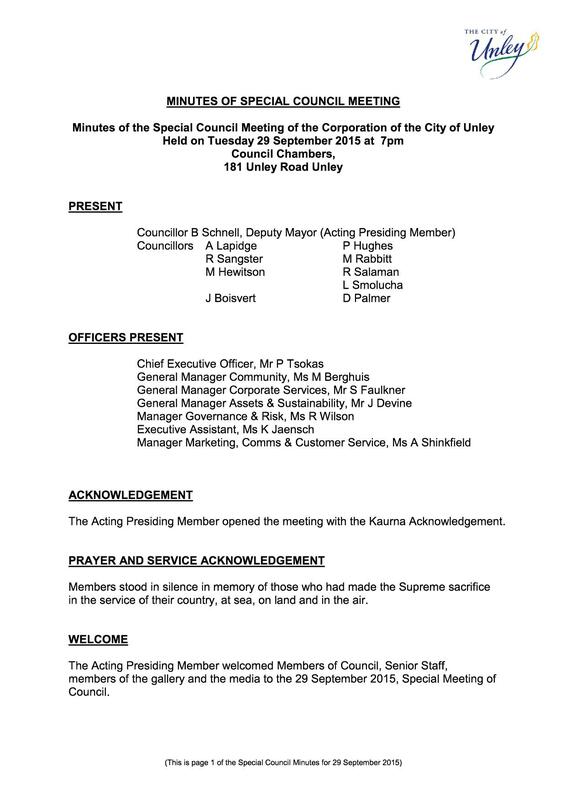 The decision can be found on the City of Unley website here. Click on “Special Council Minutes 29 September 2015. Read item 3 of the motion moved by Cr Lapidge and seconded by me (it’s the last one) to better understand what we have done that sets us apart form the other councils. Minister Rau picks up the Planning Reform Pace. Don. A very self- justifying view. You say you supported investigating the culvert option to protect the property owners adjacent the Brownhill Creek Recreation Park. Result– no culverts (good decision) and the owners adjacent the recreation park in Mitcham have no impact. You have always said that you supported a dam as part of the solution until the few days before you have to actually vote and then, despite saying that you have insufficient information on dams or creek capacity upgrade to make a decision, you vote to ensure creek capacity upgrade Option D is accepted. Option D has the most negative impact on your Part B Unley residents of all the options and the Mitcham suburban residents. The alternative of a dam in Ellison’s Gully (Option B2) was the obvious solution for your most affected Unley creek property owners (and Mitcham creek property owners) with NO affect on the Brownhill Creek recreation Park. The Ellison’s Gully site affects, very marginally, two (only) property owners on farming land, whereas your supported Option D affects the immediate living spaces of all the creek property owners along the creek course, from the Caravan Park to Anzac Highway. AND there is still no control over any floodwaters, but ALL dumped into the creek at once. As a builder, you would know that such words as “seeks the support of..”, “ensure that fair compensation is negotiated”, “trees of importance” and “if possible” etc in your supported resolution, have no standing and provide no protection for your most affected residents. You say Unley is the Council watching out for the interests of the creek owners. This would be true IF the Council (you) had supported those Councillors advocating Option B2, particularly in the early meeting of 14th September, to provide a lead for an alternative to Mitcham’s unreasonable and long term intransigence. You gave away the best interests of your Unley creek owners (and Mitcham’s) to “go along with the crowd” and not get the best flood mitigation solutiuon. Thank you Trevin for your contribution, not just to this post but to your continued interest in pursuing what you believe to be right. Please trust me that my interest in pursuing the option approved by council is in your best interests as creek property owner. With Unley Council being the last to vote be assured Option D is what will occur if and when the project actually gets started. However Unley voted Option D is what was going to happen. The other 4 councils voted option D. Fact is the SMA also wanted Option D and the minister wanted Option D.
Cr Jennie Boisvert is correct when she questions why the project team went out to public consultation because they wanted Option D (for whatever reason). Looking back on the process Option D was always going to the option taken up. If the councils did not agree Option D would have been what the SMA proceeded with. The brief by the SMA was for all councils to agree or they would take it away from us and do it themselves. So the next question must be does Unley make a stand (assuming that is what the majority of councillors want) and run the risk of not being part of the team going forward or do we accept the inevitable and ensure we remain part of the team. Will this guarantee protection of the rights of property owners? Can’t answer that one, MAYBE NOT. Make no mistake though, by being part of the team, we at Unley are best placed to go to bat for the property owners and gain some concessions just like Jennie & I did on the recent Grade separation project in Clarence park ward conducted by DPTI.